I eat sweet potato fries all the time. Sweet potatoes are one of those veggies that I didn’t touch as a child. I wouldn’t even eat them in casserole form topped with marshmallow, syrup & nuts. Nope. I was only interested in your “normal” mashed potatoes as a child. I didn’t even really try, or remember trying, sweet potatoes until just a few years back. Now, I eat them several times a week. My new favorite way is to eat them in steak fry form. I used to make them in rounds, more like thicker chips, as you can see here. Friday night, I tried the new, better way and love them!! These are so easy to make, it isn’t even funny. I sliced a single sweet potato into steak fry shapes first. Then, I sprayed with Pam and seasoned to my liking (I just used sea salt, pepper & cinnamon). I tossed into the oven at about 375 – 400 and let them go. I checked on them every 10 minutes or so and flipped about half way through and then towards the end again to brown up on all sides. They ROCKED!! I served them along side of an open-faced fried egg sandwich. 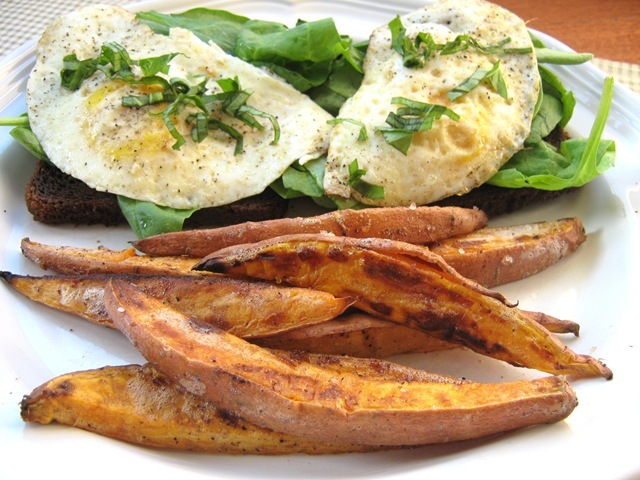 I toasted 2 slices of Kinnikinnick’s Many Wonder Multi-Grain Bread and then topped with fresh baby spinach, fried eggs and fresh chopped basil. So good and went perfectly with the sweet potato steak fries!! If you like sweet potatoes, give these fries a try! Phew, hot one out today! 96 with a heat index of 104. It wouldn’t feel so bad if we had been having this weather all season, but it has been unseasonably cool here in Ohio. I have to admit that this warmer weather has left me uninspired to cook much. Too hot to turn the oven on, even with A/C. There has been a lot of grilling going on. School starts in 17 days. I will miss having the kids around, but I look forward to being back on more of a structured daily schedule. Plus, the arguing is getting a little much. I declared one day last week “National No Arguing Day”. The kids didn’t buy it. Darn! LOL!! A friend of ours gave us some cucumber & zucchini from their garden the other day. 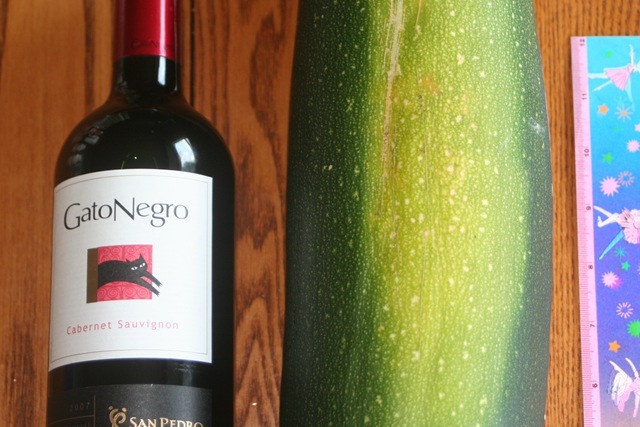 You have to see this zucchini. Jon was pretending to use it as a baseball bat, it is that big!! 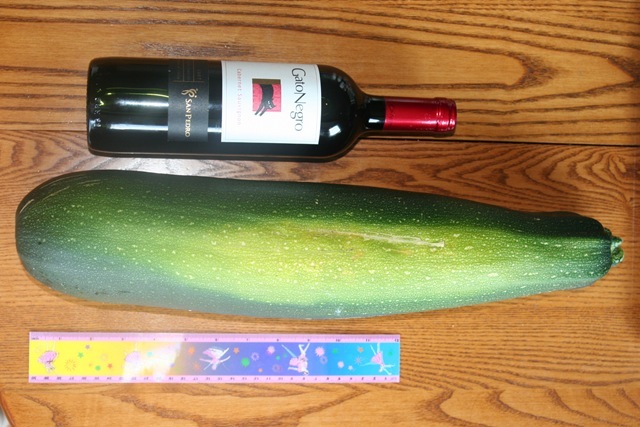 This is a 12 inch ruler and a 750ml bottle of wine, for reference. Look how big around this thing is! Not sure what I am doing with this monster yet, but I see some zucchini bread in our future!! Sunday ~ Rotisserie Chicken, baked sweet potato w/cinnamon & Greek yogurt, fresh green beans & mixed greens salad. Thanks to Cheryl at Gluten-Free Goodness for hosting the temporary GF Menu Swap HQ. For more great menu ideas, visit Orgjunkie. Reminder: Do you want to write for The Examiner? Check out this post for more information. A great way to reach out to others, have fun & make a little extra money! They are nationwide! Make sure to mention where you heard about The Examiner. My referral Examiner number is 15655. I hope you all have a great week!! Make sure to check back tomorrow & later in the week for some awesome giveaways!! #1 ~ Erin! Erin said not the most creative answer to your question but I would like to win because I have never tried the black pepper variety or the sticks/twigs! Congrats Erin!!! I will ship your crackers & coupons out early this week!